LANSING — The speaker of the Michigan House has ordered a review of the main fundraising committee for House Republicans after discovering the committee’s public reports differed from bank balances by about $100,000, according to newly obtained emails. According to multiple sources and emails obtained through the Freedom of Information Act (FOIA), the financial review of the House Republican Campaign Committee (HRCC) is ongoing. Republican leaders are trying to figure out why public disclosures report HRCC having more money than what appears to be in HRCC’s accounts. Michigan law prohibits political committees from knowingly submitting inaccurate campaign finance reports and from omitting expenditures from their public reports. 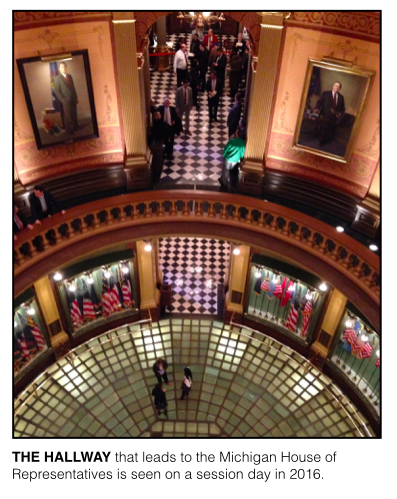 The 2016 fight for control of the Michigan House was the most expensive in state history, and HRCC was Michigan’s most active political committee in fundraising for the 2015-2016 election cycle. Helping Republicans win a 63-seat majority in the House last fall, HRCC disclosed $4.2 million in contributions — more than any other committee — and $4.0 million in spending. A joint investigation by the Michigan Public Radio Network and the Michigan Campaign Finance Network found that Republicans now believe that HRCC’s public disclosures may have left out some of amount of spending in the run-up to last year’s election. According to an email obtained through FOIA, Rep. Tom Leonard (R-DeWitt), the top House Republican who was elected House speaker after the Nov. 8, 2016, election, ordered a financial review after a “discrepancy” was found in the balances between HRCC’s public campaign reports and HRCC’s bank statements. Eric Doster, a campaign finance attorney, informed the Michigan Department of State of the financial review on Jan. 30 in an email and phone conversation, according to documents obtained through FOIA. The Department of State is charged with enforcing Michigan’s campaign finance laws and levying fines in situations where committees violate the law. Fred Woodhams, the department’s spokesperson, said HRCC plans to provide the department with revised campaign finance reports to try to resolve the discrepancies. Stu Sandler, a consultant for HRCC, took questions on the matter on behalf of HRCC and Leonard. Sandler wouldn’t confirm that the reports were off by about $100,000 or what caused the discrepancies. Sandler said the situation leading to the discrepancies played out under the prior HRCC campaign team. Sandler wouldn’t comment on whether he believes laws were broken as he emphasized the review is ongoing. HRCC's campaign team frequently changed in 2016. Leonard was the HRCC chair until about March 2016 when he stepped aside because of his bid for the House leader position. At that point, then-Rep. Aric Nesbitt, a Republican from Lawton, became chair. He was chair during the 2013-2014 cycle as well. The whole time, former Rep. Kevin Cotter, from Mt. Pleasant, was the top ranking House Republican serving as House speaker. Cotter and Rep. Mike McCready, from Bloomfield Hills, each served as HRCC’s treasurer at different points in the 2015-2016 cycle. There were other staffers who worked under the campaign's leaders. On Jan. 20, 2017, after term limits forced Cotter out of the House, Cotter and HRCC’s previous recordkeeper, Jenna VandeKamp, asked the Department of State to remove themselves as HRCC’s official treasurer and recordkeeper. “I continue to stand by that commitment,” Cotter said. The indication of some type of problem with HRCC’s disclosures appears to be visible in the public reports it filed with the Department of State. On July 25, 2016, four months before the election, HRCC reported $2.219 million cash on hand at the close of the July reporting period. When HRCC filed its disclosure for the next period on Oct. 25, 2016, it reported that it had $2.214 million cash on hand at the close of the July period. The reported balances were also different for the disclosure at the end of the October period — $2.254 million — and the disclosure at the end of the January period, which said HRCC had $2.248 million at the end of the October period. The differences between those numbers are small compared to differences Republicans now believe exist between their campaign finance reports and their actual bank balances. Richard McLellan, an attorney who's often worked on campaign finance issues in Michigan, said discrepancies can happen in campaigns and “can happen innocently” through simple mistakes. A discrepancy of $100,000 would be significant, McClellan told the Michigan Public Radio Network.